VANCOUVER -- Researchers at the University of British Columbia say they've found a way around the nuisance and potential danger of repeatedly having to plug in an electric car to get it moving again. Prof. Lorne Whitehead, with the university's physics department, says his team has developed a way to wirelessly recharge the vehicle using a frequency 100 times lower than what's used now. "Wireless charging has been a much sought-after technical solution for everything from cell phones to electric cars," Whitehead said in a news release. "A significant concern for charging cars wirelessly has been the high power and high frequency electromagnetic fields and their unknown, potential health effects on humans." The UBC researchers came up with so-called "remote magnetic gears," a system that has been successfully tested on campus service vehicles. Whitehead said it involves two magnets, one in the parking spot that rotates on electricity from the grid and the other within the car. The outside magnet remotely spins the in-car gear, generating power to charge the battery. Recharging starts as soon as the car pulls into the parking spot. "One of the major challenges of electric vehicles is the need to connect cords and sockets in often cramped conditions and in bad weather," says David Woodson, managing director of UBC Building Operations. "Since we began testing the system, the feedback from drivers has been overwhelmingly positive." Four wireless charging stations have been installed at UBC's building operations parking lot. Tests show the system is more than 90 per cent efficient compared to a cable charge. A full charge takes four hours and enables the vehicle to run throughout an eight-hour shift. Originally, the magnetically-driven charging system was aimed at medical devices such as an implanted pacemaker. A patent for the technology involved in the larger system has been filed through the university's industry liaison office. 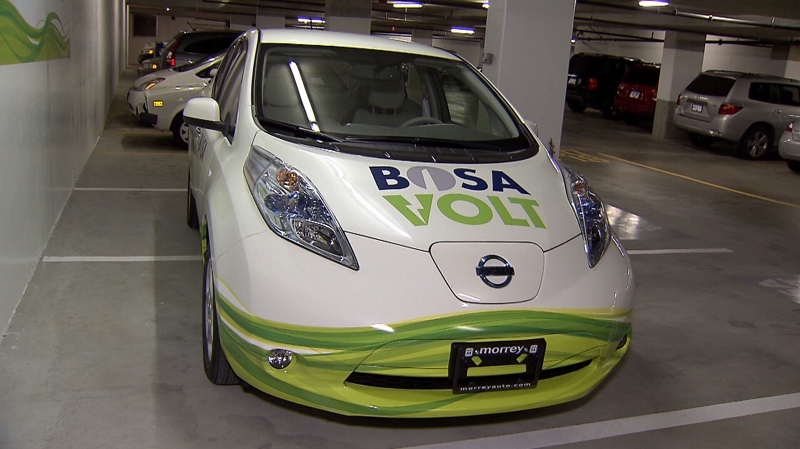 A Bosa electric car is seen in this file photo.